← YGBFkiddinme, Low Emissions Grass? 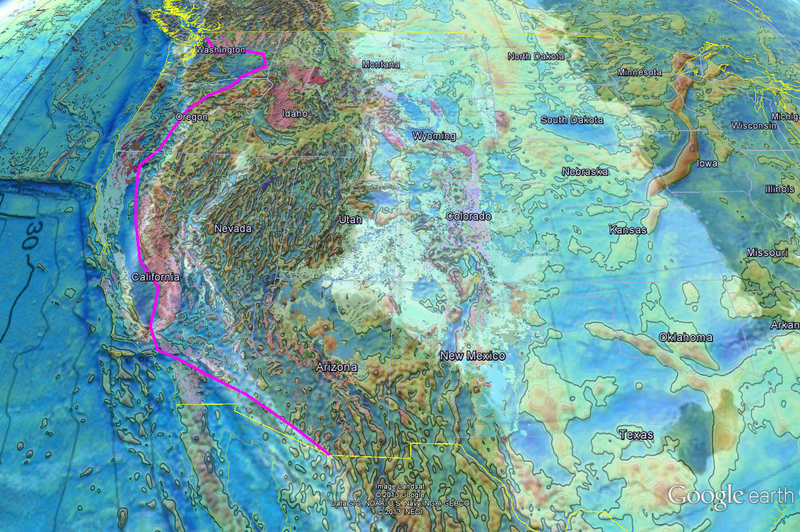 A huge problem with geological maps is that their daunting psychedelic maze of colors makes it very difficult to bear down on specific features. We recently discovered a GIS series of State scale maps from USGS where it is possible to turn on and off individual geological units. This is a quick report on an ongoing effort to bring higher resolution data to bear on the shapes of the continental margin. The protocol here was to strip the entire Tertiary section from the opaque geology. The result is that the Tertiary becomes a window into the underlying current gravity layer. A late Cretaceous paleogeographic map by Ron Blakeley was then rubbersheeted to match the State of Colorado and aligned at the Four Corners. This was not a satisfying procedure but the result is close enough to show what Ron was thinking. His layer was made transparent to the extent that the gravity and geology are visible and his continental areas read as dark shading. It is interesting that Ron shows the sierra batholith as a peninsula with an inland sea extending into Nevada behind it. I am going to respectfully disagree about this inland sea based on the lack of Cretaceous marine sediments and the plentitude of granitoid plutonism in the region. Wherever you see granite, something was cooking. Our magenta line attempts to show the western edge of Cretaceous granite. Ron shows a large inland sea in the central U.S. that is certainly borne out by widespread Cretaceous marine sediments. This entry was posted in Geography, Geology, Gravity Anomalies, Paleogeography, Plate Tectonics and tagged Continental margin, Cretaceous, Paleogeography. Bookmark the permalink.